The pharmaceutical industry is highly regulated and for good reason. The healthcare sector and the public at large must have full confidence that products will be delivered as promised and without contamination. The safety of patients depends on it. With the stakes so high, pharmaceutical facilities depend on procedures that deliver reliable results. Moore ASG can provide facilities with the cutting-edge disinfection and decontamination technology of SteraMist BIT. 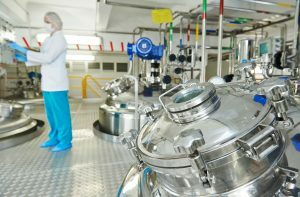 Pharmaceutical Processing -When producing pharmaceutical products, it is essential to minimize the risk of microbial or fungal contamination. Effective disinfection and decontamination protocols, such as those that include SteraMist BIT, can help ensure product safety. Pharmaceutical Manufacturing -Pollutants in pharmaceutical manufacturing operations can be devastating. SteraMist BIT can help companies avoid this kind of disaster. Pharmaceutical Compounding – Pharmacies that perform compounding services must adhere to strict guidelines in order to protect patient safety. SteraMist BIT can help pharmacies to fulfill the requirements for disinfection and decontamination. Decontamination and Deodorization — Our decontamination services utilize SteraMist to kill air and surface bacteria and bacterial spores, and inactivate viruses, mold and mold spores. Emergency Operations Planning (EOP) and Training — Let us be your solutions partner to provide: annual environmental tours and hazard surveys, infection control risk assessments, readiness audits, and more. Asbestos Abatement — Our asbestos abatement team will establish a safe work environment by surveying and testing, maintaining test protocols, and conducting asbestos abatement. Does not damage equipment so rooms do not need to be emptied. Even highly technical equipment can be left out.